A graphic pattern in subtle warm tones will dress up your window and bring a breath of fresh air to you decor. 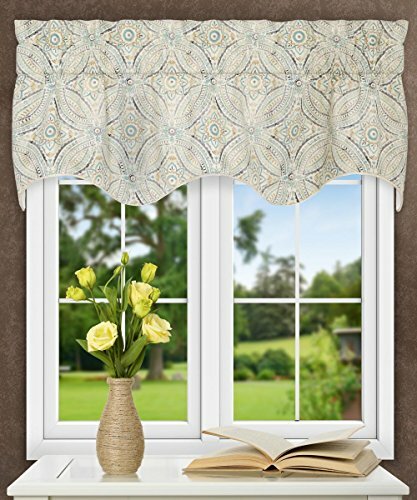 This multi colored medallion print lined scallop valance is made of 100% cotton. High quality fabric drapes perfectly with an elegant cord finish. Length is measured at 15-inches from top stitch down and width is measured at 50-inches. The Blissfulness Scallop Valance has a 2-inch header and a 3-inch rod pocket. A natural colored broadcloth liner has been sewn in for added privacy. Dry clean only. If you have any questions about this product by Ellis Curtain, contact us by completing and submitting the form below. If you are looking for a specif part number, please include it with your message.